The Treasure Hunting Toad's newly-established shop. The treasure-hunting Toad is a Toad from the game Super Mario RPG: Legend of the Seven Stars that can be found in the Coal Mines and later in the Moleville Item Shop. 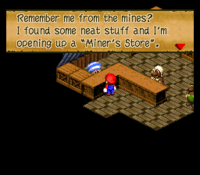 After defeating Punchinello for the third Star Piece he can be found in the Moleville Item Shop where he sells his treasure findings to Mario. It is possible that this Toad is a native of Rose Town, due to his striped mushroom cap and the fact that Moleville is the nearest town, just west of Rose Town. Item #1: The Lucky Jewel (100 Coins), ensures that Mario and his party get a LUCKY! Flower during battle; however, it can only be used a few times before vanishing completely from the player's inventory. Item #2: The Mystery Egg (200 Coins), if used ten times in battle by Toadstool while equipped with the B'Tub Ring, it turns into Lamb's Lure. Item #3: The Frying Pan (300 Coins), is a weapon that can be used by Princess Toadstool in battle. This page was last edited on March 1, 2019, at 01:37.